Leaving behind Mr. and Mrs. Childs, we see ….. The north side of the Market Place from the King’s Head (5 Market Place) to the Market Inn (8 Market Place) in the late 1870’s. (courtesy of Ilkeston Reference Library). Jedediah Wigley, known as Jerry Wigley, built two shops, also the Market Tavern (on the north side of the Market Place). Jerry was the landlord of the Market Tavern. One shop was empty for a long time until taken by Mr. John Wombell, stationer, of Bath Street. The second shop, used by Jerry’s daughter Sophia for a millinery and dressmaking business. At another point Adeline records that his two daughters carried on a Millinery and Dressmaking business. 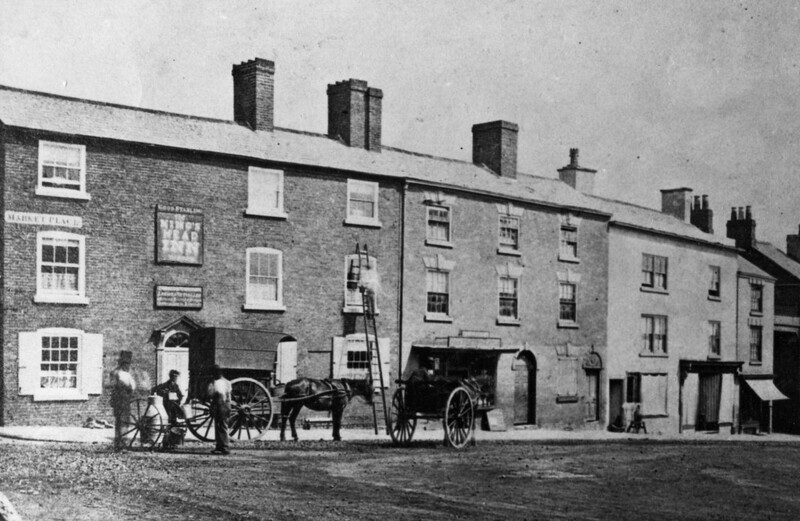 The Market Inn was at 8 Market Place. In 1841 Jedediah was a builder living in Burr Lane with his wife, Ruth (nee Ottewell), daughter of John and Mary (nee Martin), and his daughters Elizabeth, Mary, Martha and Sophia. In that year he bought a piece of land in the Market Place from Mapperley farmer Joseph Fletcher, soon after demolished the existing buildings there, and then built two new premises with adjacent stables, cart shed, brew houses and other outbuildings. The Market Inn beerhouse was in the rear of one of the two buildings, its entrance facing into the alley at the side. Builders Jedediah and Robert were in a partnership but this was dissolved at the beginning of 1843. And wouldn’t you just know it !! You wait 30 years for one to arrive and then three come along at once!! In August 1858 Jedediah was granted a licence to trade as a victualler. At the same time a similar licence was granted to Matthew Fletcher at The Havelock Tavern in Stanton Road and Samuel Lowe at the Needlemakers’ Arms in Kensington. Quite an event for Ilkeston!! These were the first victualler’s licences to be granted in the town for about three decades. In 1863 Jedediah lost a crop of turnips which he had been cultivating in his garden….half of them were stolen while the rest were cut in two. The nearby garden of John Wombell was also visited by a midnight harvester who made off with all his lettuce and white cabbage, while about a dozen red cabbages were wantonly vandalised. Shortly before this, similar attacks had been made on gardens in the Lawn and in Market Street. In July 1864 eldest child Elizabeth Wigley married John Ball, eldest child of Francis and Mary (nee Hirst) and thus joined him to live at 42 Upper Talbot Street in Nottingham. She died in that city in November 1912, aged 88. She and John are buried together in Stanton Road Cemetery. In 1868 daughter Sophia joined her sister Martha to continue the millinery business. The other daughter, Mary, had married Eliezer Paling, starch manufacturer of Newark, on June 15th 1853 and for a time left Ilkeston. Then in October 1869 Eliezer’s starch and flour works in Albert Street, Newark, all the adjoining and connected premises, and all the trade’s machinery and implements were put up for auction at the Woolpack Inn in Stodman Street…. an auction conducted by his younger brother Frederick. (In January 1870, at a different venue and with a different auctioneer, the premises were again up for auction). Mary had not left the tavern trade however as she and her husband eventually settled at the same Woolpack Inn. Across the alley from these premises was Jedediah’s second building – 9 Market Place — which was sold to William Marshall, baker, and above which was a printer’s workshop occupied from early 1859 by John Wombell of the Pioneer. Mr. Bourne, who had married one of Jerry’s daughters, followed Mrs. Wombell. He started in business as a bookseller and stationer. Shortly John Wombell moved a few doors away, into the premises of Woolstan Marshall, leaving Charles Henry Bourne, master printer, to move into the upstairs workshop. Perhaps his proximity to the Wigley family had some effect on Charles Henry. In June 1873 he married Sophia Wigley and moved into the Market Inn to take over from Jedediah in November of that year, though the licence was transferred in the following month. In May 1876 Jedediah lost his place on the Local Board through non-attendance but by that time it was probably of little concern to him. He died of acute bronchitis in November 1876, “suddenly as he was sitting by his fire in his own house in the Market Place”. He was 78 years old. Two years later and after his widow Ruth had died at the same house, the Market Inn was put up for sale. It comprised of a bar, tap-room, large club-room, parlour, capital front room suitable for vaults, upstairs sitting-room, four bedrooms, kitchen, with a brew house, washhouse, stabling, cow and cart sheds, and a large garden. At the auction up to £3400 was bid but this did not meet the reserve and the Inn remained unsold. Offered at the same auction and also unsold were the adjacent milliner’s and printer’s and stationer’s shops and the printing office to the rear, and Charles Henry continued there for several years. Eventually the Inn was sold to Ripley Old Brewery Co. In August of 1878 the inn was up ‘to let’ with the shop at its front up for let in the following September. Its full particulars could be supplied by the Ripley Old Brewery Co. Ltd.
At that time Charles Henry Bourne was still the inn’s landlord. The tool-shed in his back yard was serving as temporary home for six cases of ginger beer when a servant at the inn noticed late one evening that seven bottles were missing from the cases. About the same time a police sergeant on his beat in the area heard the sound of breaking glass coming from the inn yard and both these witnesses spotted possible culprits running away from the area. Suspicion quickly fell on two Pimlico lads, 12 year-old Barnabas Webster, son on Barnabas and Rebecca (nee Stanley), and Thomas Quinn junior, aged 14, son of Thomas and Margaret (nee Marony). Under questioning Thomas junior cracked first but stated that he had been led into the crime by his mate who had already stolen two bottles of the beer before they both paid a second visit to the yard to collect another five. As they were drinking from one, it was dropped and broken, so they quickly scarpered with the remaining loot which they hid in a garden near the Waterworks. At the Petty Sessions they both pleaded guilty and because of their youth they were detained for two days only and received 12 lashes. In December 1878 the license of the inn was transferred to Morris Gregory, late of the Crown Inn, Ripley, and formerly of the Jolly Boatman, Ilkeston. In 1885 John Robinson, future Sheriff of Nottingham, was the lessee of the Inn. The draper’s shop was next.